...It's a nice concept, wearing an allover fuzzy blanket with arms. It's cosy, forgiving and inexpensive; it's also sticky with static, garish, feels nasty against the skin and it doesn't enhance your goddess-like beauty. 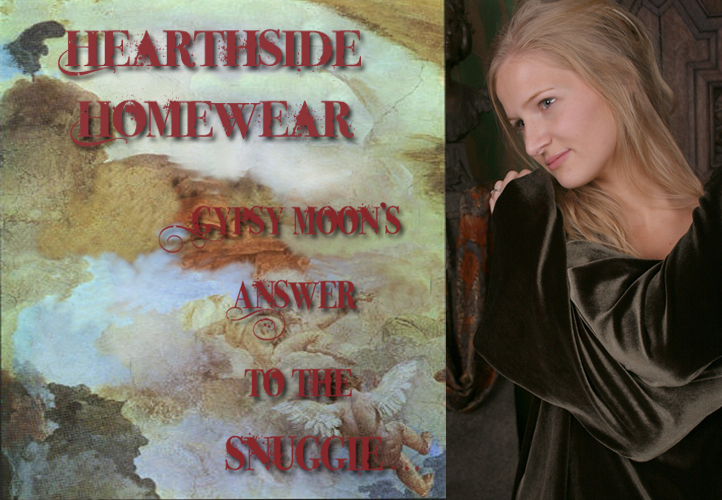 We have been listening to requests from customers and decided to introduce Hearthside Homewear from Gypsy Moon. It will be inexpensive, made for most sizes, very comfy and forgiving but best of all...it will be romantic, elegant and feminine. And no one will mistake our Homewear for a bib. We are offering the first run of our new collection in stretch velvet for winter. There are more colors available, just ask us and we can probably make it for you.